The long-fought effort to preserve and protect green space on the Milwaukee County Grounds is at a critical juncture. Followers of the issue will remember that when the City of Wauwatosa unveiled its Life Sciences District Master Plan in January 2017 there was a tremendous hue and cry about its proposal to put intensive new developments within the section known as Sanctuary Woods. Now, nearly two years later, the Life Sciences District Master Plan has been revised. The County Grounds Coalition has been at the forefront of the effort to protect this treasured landscape. We want to encourage you to attend a Public Hearing on the revised Life Sciences District Master Plan on Tuesday Dec. 4th, at 7:30 pm. 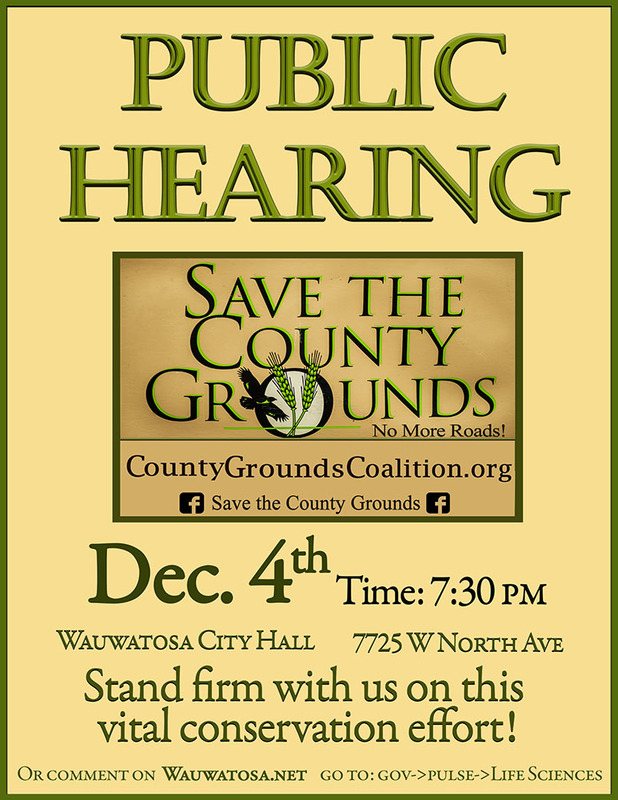 It will be held at the Wauwatosa City Hall: 7725 W. North Ave. The newly drawn preservation area map the revised Master Plan is a major improvement over the original one. The public hearing will enable the Wauwatosa Common Council to recognize our support for the revised map as well as our concerns that additional details are needed within this plan. At a committee hearing in October, the County Grounds Coalition commended the City on their modifications of the map and requested five points of preservation be added/addressed within the plan. At this time, these five points are NOT clear or strong enough to be effective. Please come to hear our recommendations, hold up signs and support our requests! Please forward this information to all of your contacts. Bring your friends, family, and others who visit this treasure and all who understand that the future of this land is in our hands. Any new development/building that occurs on the northeast quadrant should comply with the protocols of the International Dark Sky Association (which protect nocturnal animals). Light pollution impacts natural areas. Federal guidelines for the endangered rusty patched bumble bee should be adhered to—and incidental take permits must be applied for with any new developments. The City should work closely with environmentalists regarding building heights in areas adjacent to the County Grounds. The value of this land as a migratory bird corridor could easily and irreparably be destroyed by tall buildings. This plan should reflect and remain consistent with the approved Business Planned Development Zoning district for UWM’s Innovation Campus. It should also reflect and remain consistent with Milwaukee County’s Land Sale Agreement. 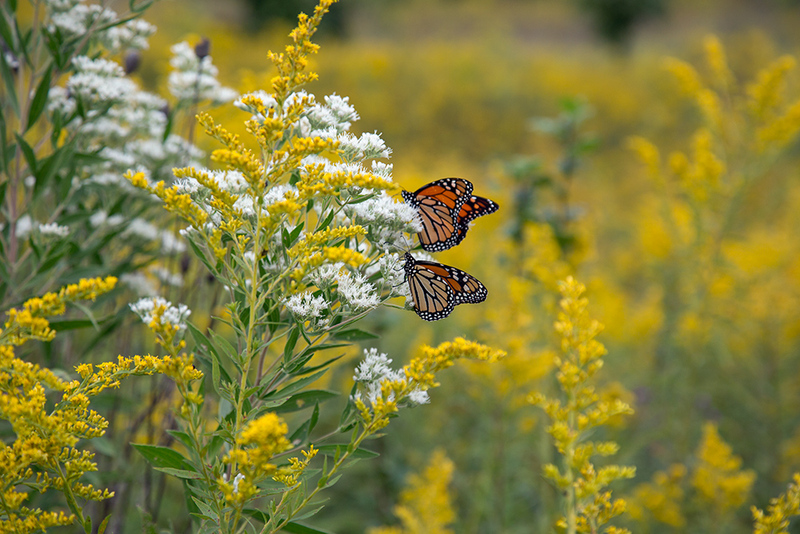 All new landscaping within the quadrant should emphasize and prominently feature native plants and reflect the recommendations in the Habitat Protection Plan for the Northeast Quadrant. Contact the Common Council members: https://www.wauwatosa.net/government/common-council/contact-the-common-council by email or phone. Barbara Agnew is a member of the County Grounds Coalition and the Director of the Friends of the Monarch Trail. Photo by Eddee Daniel, Preserve Our Parks board member and project director of A Wealth of Nature.